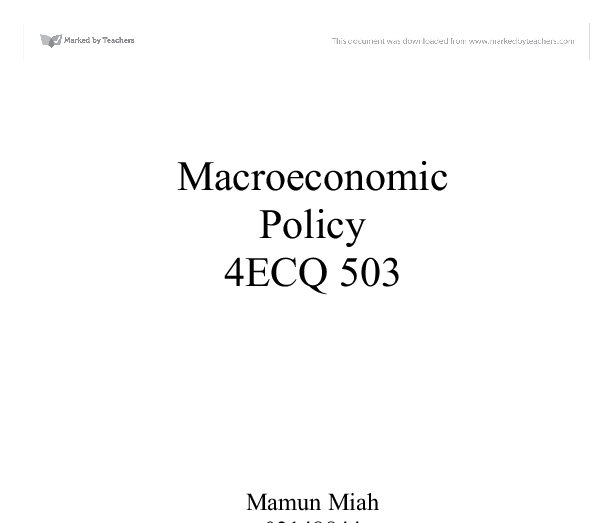 Macroeconomic Policy 4ECQ 503 Mamun Miah 03148844 Business Management (a) Examine the difficulties which confront policy makers when they attempt to formulate macroeconomic policy. 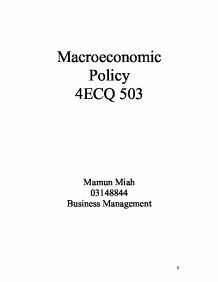 Macroeconomic policy is mainly concerned with attempting to intervene and change the functioning of the economy in order to improve its performance1. It is used by the government and Central Banks (Bank of England), usually intended to maximise growth while keeping inflation and unemployment down. To summarise macroeconomic policy involves three initial steps: 1. The determination of the policy objectives and the conflicts between objectives. 2. The formulation of policies, which are known as instruments, are consistent with attaining the objectives. 3. Some elementary cost-benefit calculations of policy effectiveness to ensure that the net benefits outweigh the costs involved. The four major objectives of macroeconomic policy are2: * Full employment- unemployment is to be avoided because it results in a decrease of output in the economy. In addition, unemployment reduces the incomes of former workers, increases poverty and leads to demoralisation among the unemployed. * Price stability- inflation is regarded as a major source of concern because it confers few benefits but imposes major costs on society. For example, people on fixed incomes suffer a fall in their standard of living; debtors gain at the expense of creditors as the real value of debts or loans fall; and country's exports become uncompetitive in international trade. ...read more. The estimated time lag is often one year or more. A year is a long time for an economy and government policies may end up stabilising effect rather than a stabilising one. The three types of time lags involved in the process are recognition lags, implementation lags and response lags6. * Recognition lag is when the government discovers that policy intervention is called for. The government take time to recognise the existence of a boom or slump. It takes time for data to be collected and elaborated into useful information. * Implementation lag is the time it takes in implementing a policy. Once a recession or a boom has been established and identified, it takes time to agree on which policy to choose and to implement it. * Response lag is the time it takes for the economy to respond to the applied policy. Even if implemented quickly, policies take time to produce their effects. This is especially true of monetary policy. It takes several months before the easing of money market conditions and depreciating exchange rates have an impact on real activity. Any macroeconomic policy with a significant impact on economy will require legislative approval. Legal restrictions on public revenue and expenditure make fiscal policies inflexible. ...read more. Insufficient information may discourage policy-makers such as the government and the Bank of England, from adopting certain policies that seemed best, because of the risk of the policy proving to be wrong. Instead the policy-makers may adopt an alternative, a more cautious policy that minimises the risk of an unacceptable outcome. Keynesians argue that many prices are set in advance because of an imperfect knowledge of future conditions. This results in wrong pricing and resource allocation decisions. Monetarists say the best policy is to do nothing at all. If uncertainty is the problem, governments can help simply by not making matters worse. 1 R.T Froyen (1998) Macroeconomics: Theories and Policies, Sixth Edition, New Jersey, Prentice-Hall Inc. 2 www.tutor2u.net/economics 3 R.T Froyen (1998) Macroeconomics: Theories and Policies, Sixth Edition, New Jersey, Prentice-Hall Inc 4 Nadia Tempini Macdonald (1999) Macroeconomics and Business, London, Thompson Learning 5 P. Christopher and L. Bryan (1995) Business and Macroeconomics, London, Redwood Books (p45) 6 Nadia Tempini Macdonald (1999) Macroeconomics and Business, London, Thompson Learning (p141) 7 P. Christopher and L. Bryan (1995) Business and Macroeconomics, London, Redwood Books (p41) 8 R.T Froyen (1998) Macroeconomics: Theories and Policies, Sixth Edition, New Jersey, Prentice-Hall Inc. 9 Bank notes and coins in circulation plus banks' till money and operational balances at the Bank of England 10 P. Christopher and L. Bryan (1995) Business and Macroeconomics, London, Redwood Books (p62) 1 ...read more. Also it causes employment to rise and voluntary unemployment to fall, but the problem is this isn't effective in a short run, it is only effective in a long run. Fiscal and monetary policies can't just be used by anyone, as it is not easy to control unless you really know what you are doing. One of the causes of inflation is when firms respond to rising production costs by raising their prices in order to maintain their profit margins. Higher costs shifts a firm's supply curve upwards and lead to an increase in price. It is the long-term economy because of the productivity and technology changed, and the GDP will be changed by different factor, for example, UK is still behind other countries, such as German, US because they don't want to invest money on machinery. Someone could choose not to work because they lack knowledge of using computers. If someone was taught the basics of computers, it would help them in the workforce. This is only one reason why people are unemployed, but training would eliminate one large sector of the unemployed. This is why unemployment figures are seasonally adjusted. Structural unemployment occurs when there are changes in the whole structure of the economy. This usually occurs when there is a decline in a leading industry. Structural unemployment tends to affect certain areas of the country e.g.
? While there can be little doubt that the crisis must be stopped now rather than later, much doubt has been voiced that the European Union, or for that matter the member countries of the Eurozone, have the means to do so. Are there any problems with the use of GDP as a measure of growth? GDP only measures output; it doesn?t measure any investment made by firms or other counties. Plus it only measures the output by British firms, and as most of the companies in our economy are foreign it doesn?t say much.